right now T3 is hosting a contest on Pinterest called What's In Your Bag? 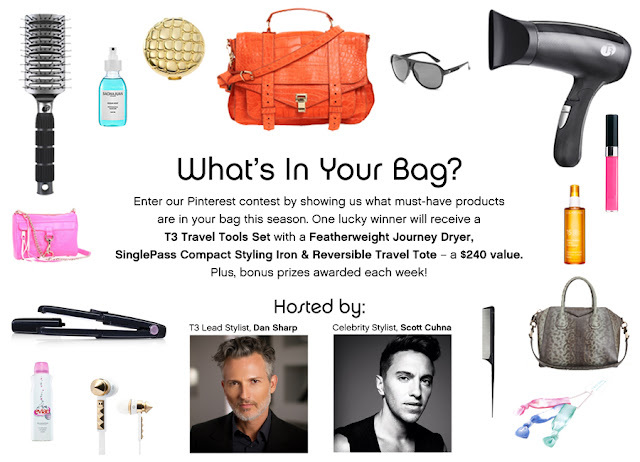 it is a fun opportunity to enter to win a T3 Travel Tools Set including a Featherweight Journey Dryer, SinglePass Compact Styling Iron and Reversible Tote ($240 value). because T3 is so awesome (you may have seen me raving about them here) i was hoping to share a T3 product with Blushing Basics readers, and guess what? you can also have a chance to win the SinglePass Compact Styling Iron (shown above) by entering the Rafflecopter giveaway widget below.